On a gorgeous sunny morning the Kosmos team drove 30 minutes south to meet new economist Susan Witt on the picturesque grounds of the community land trust in Great Barrington, Massachusetts. She greeted us at the car and showed us inside the New Economics Institute’s rustic office building to a light-filled room with rows of bookshelves. Susan co-founded the BerkShares local currency program in 2006 and has watched as this experiment in community empowerment has garnered international media attention. Since putting the currency into circulation, the BerkShares website has received more than 7 million hits—an impressive number even before you consider that the institute has a staff of just three. About $2.6M BerkShares are invigorating the financial bloodstream of the Berkshires, Susan’s home region, and the program’s goal is steadfastly being realized. BerkShares provides a model to other progressive communities around the world that want to establish their own more self-sufficient, independent, resilient and sustainable economies. Nancy Roof: Susan, you are a pioneer in local-to-global work and we feel fortunate to have you right here in the Berkshires, leading us toward a sustainable local community. How did you get started with your career in economics? I had a trusted friend who kept saying, “The modern hero is the modern businessman.” And I thought, “Give me a break!” But he kept at it until I began to realize that in America, in the last part of the 20th century, indeed it was almost our destiny to deal with the economic in a new way. It was our element, what we were giving to the world. We moved easily through it but we weren’t moving well or responsibly. Those who were bringing a new dimension—social, ecological or spiritual—to the economic were, in fact, facing the trials described in literature: the trial of despair, the trial of not succumbing to greed, the trial of distraction, the trial of the inner wasteland. Striving to bring a higher impulse to the economic—there lived the modern hero! I came to realize that the modern hero was one working to bring about a new approach to economics, one in which people and the planet mattered. The card file was, of course, pre-computer, so it was their whole database of contacts and donors. I would come down once a week to work and take in the vibes and then would take some work home. In 1978, they started the first social investment fund with positive criteria called the Community Investment Fund. Until that time, investment funds said no to tobacco, alcohol and South Africa but not yes to co-ops, appropriate technology and worker ownership. When they asked me to staf the Community Investment Fund, I said, “No experience.” They said, “You’ll learn on the job.” I never did write the novel! What a fascinating journey from one career to the next! And now you’re transitioning from the E.F. Schumacher Society to the New Economics Institute. I’ve been following the New Economics Foundation in London, which is in the forefront of the field, so I was excited when I realized you were partnering with them. What will happen to the Schumacher Society? The Society is now formally the New Economics Institute. This name better describes overall what we’re doing. We’ll archive our old website and maintain the Schumacher Society lectures that we’ve made available for thirty years in pamphlet form and more recently online too. We’ll also keep Schumacher’s library, an extraordinary gift given by Schumacher’s widow Vreni. His collection is not only on economics but on religion and philosophy as well, and it took all those influences to shape the new economics. Schumacher was certainly one of the foremost new economic thinkers and also a global thinker. He worked as an economic consultant in India and Burma, where he came to understand that the most sustainable economy is one where the goods and services consumed are produced within the region. Local people are conscious of the production methods and notice if there are ecologically irresponsible practices. They can see how workers are treated. There isn’t the abstraction that is now part of the global economy so that we don’t know the stories about the goods we use. That can mean being complicit in a lot of bad practices. If we knew what was really going on, we’d be appalled. Let me give you a little more context on how the Schumacher Society developed in England and here. Satish Kumar, the founder of Resurgence magazine, started the Schumacher Society in England in 1977, after Schumacher’s death. A few years later, he asked Bob Swann and me to start the Schumacher Society in this country. Bob was a good friend of Schumacher. He brought him to the US in 1974 and had him meet with President Carter. This was at the time of the oil crisis. Remember long lines at the gas stations? Schumacher’s voice was very powerful at that time. We wanted to take a new approach to land and money while the Schumacher Society in England stayed focused on the lectures. Resurgence carries the ideas forward, and there’s an intermediate technology development group called “Practical Action,” founded by Schumacher. It has oﬃces on every continent, applying technology and practical solutions village by village. Then there’s Schumacher College at Dartington. And there’s the New Economics Foundation, which started around Schumacher’s ideas. It has excellent researchers and global thinkers, excellent policy people. They were instrumental in pulling together governments and banks around 2000, the Jubilee Year, with the forgiveness of debt. Schumacher argued that a more sustainable economy is one in which goods and services consumed locally are produced locally. But he also said if everyone were for small, he’d be for big. So he was thinking of the system working on multiple scales? Yes. Of course, his famous book has the title Small is Beautiful, but he said there has to be a balance between what is happening in the global economy and a local economy with its stories about the goods that we use. Some folks refer to what we’re doing as creating whole stories about products. The quality of your life is determined by the number of stories you know about the items that you use on a daily basis. We’re about creating those economic institutions that encourage more face-to-face relationships again. We’re doing it as part of an eﬀort to educate and provide models to other regions of how they can establish their own more self-sufficient, independent, resilient and sustainable economies a network of equals rather than a network of dependents, like the economic colonization that we have now. 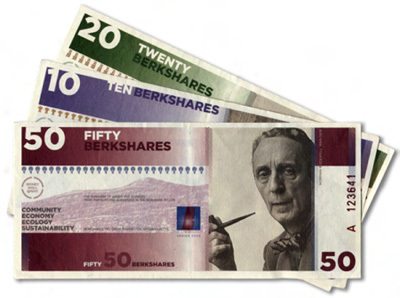 The BerkShares currency is fundamental to establishing a model of a self-sufficient and sustainable regional economy. Please tell us more about the BerkShares program that has received such wide acclaim. BerkShares has drawn extraordinary media attention because the global financial system has failed us. The idea of a local community taking responsibility for its own economic future is captivating, and the press zoomed in on it. We’re now at stage 25 of 50 stages of the BerkShares program. BerkShares are currently exchanged for federal dollars at 13 branches of 5 local banks. The 13 branches essentially give us 13 storefronts to interface with the public. It’s easy for the shopkeepers because that’s where they normally do their banking. Easy convertibility means that if shopkeepers have more BerkShares than they can ﬁnd places to spend them, they can be converted back to federal dollars, so it gives the shopkeepers confidence to sign on. About 2.6 million BerkShares have gone out from the banks, but that is a very small part of our economy with its 19,000 year-round residents. Although a local currency certainly opens certain possibilities, it also does limit trade to those in a face-to-face transaction. It’s cash. It’s a decision to have a conversation. It’s slow money—inconvenient, some would say. Well, we respond, “The war in Iraq is inconvenient too.” What do we have to do to create the type of economy that can sidestep the necessity of such global conflict? As we move in that direction, it will challenge what we think of as inconvenient. Our financial habits are deeply ingrained. They’re subconscious. To make the effort and break out of the patterns, to take responsibility for our financial transactions – that’s huge. In some ways, it’s a new paradigm. But in other ways, isn’t it a return to an older model of currency in the US? Oh, definitely. This country was founded on a system of regional currency. In the 1800s, every commercial bank issued its own currency. Local bankers knew what was appropriate for funding. They knew the guy who was asking for a loan and if he could repay it or not. Sometimes there was fraud. The federal government required gold reserves to back up the local currency. The bank inspector would come to Bank A and say, “Let me see your gold reserves… Oh, yeah, there’s the gold. It’s all there… Now, how do I get to Bank B?” And he’d be told something like: “Out the door. Up the hill. Through the woods. Around the lake.” Meanwhile, out the back door and via the shortcut, the same gold was already on its way to Bank B. But a failure of one bank didn’t mean a failure of the system. The scale was small but diverse. You didn’t have the bank bailouts that we’ve just had—banks are now all tied together and are too big to fail. Essentially, as a people, we are now subsidizing large corporations. The older complex system was more sustainable because there was more diversity, as any good biologist understands. What is the future of BerkShares? the moment, we’re just a very beautiful and sophisticated local coupon, but built in is the capacity to move to making productive loans that the community needs. At that point, it will be new money, not saved money, and we need not charge interest. National currency, which is in some ways also a global currency, is issued by the government in cooperation with for-proﬁt banks and that includes issuing for nonproductive purposes. If you issue for food, clothing and shelter you’re going to have a sound currency. But issuing for bailouts of the auto industry and the bank industry, ﬁnancing wars in Iraq and Afghanistan, ﬁnancing bureaucratic operations—none of those creates new products circulating in the economy. The purchasing value of the dollar goes down. We’re all paying for that deﬂated dollar. We all have the power as citizens in our own community to issue currency on the basis that we choose: for basic goods, not luxury goods, for businesses that treat the environment and workers well. But we gave up having a choice for the convenience of a centralized system. It allowed a lot of industry to proceed that would not have otherwise, so I’m not against it. I’m for parallel currencies at the global and local levels. Global currency is needed, but let’s make it more disciplined through our own good example. If all of us worked in our own regions to create responsible currencies, then it would challenge the centralized system to issue currency more carefully. People have forgotten the mechanics of currency issue. When the banker was the issuer of the currency, how money was issued was local knowledge. The board of the bank knew. The local businesses knew. The citizens knew. But we’ve given up this understanding because it is easier to let the government and the Federal Reserve decide how much money to put into circulation. Now we’re complicit in an economic system that is hurting the earth, our commons, our neighbors and cultures around the world. And what are we going to do about it? Would the fulfillment of the vision for BerkShares be an answer? We have done our own thinking, and I can tell you where we want BerkShares to go; however, the end stage will have to evolve out of this local community. Our goal is to create a way to ﬁnance productive loans. We hope to develop a loan program in which the prime way of issuing money is through making no-interest productive loans from a non-proﬁt community-based group (BerkShares, Inc.) that sets priorities for new local businesses. It means taking risks as a community. It might mean saying that we would really like to re-establish water power as a source of energy, so we get together as a community and ask whether we should issue money for this purpose. We may fail. Failure means a devaluing of our currency. But if all of our other loans have been sound, then it’s not a huge devaluing. So do we take the collective risk? How are we going to determine the value of our sound loan currency? We are imagining not gold, not silver, but a basket of local commodities as a determination of value. A gallon of maple syrup, a bushel of Ted Dobson’s ﬁeld greens, a quart of Sue Sellew’s goat cheese, a bushel of organic apples. We want our currency to represent the value of these tangible commodities. If you’re exchanging with BerkShares, then you know that a $20 BerkShares note is always going to get you a gallon of maple syrup. We would then need to have an exchange rate with federal dollars. That’s legally required because the federal government has to tax transactions in the local currency. But we assume that we can keep better value in our currency. For example, while our $20 BerkShares note continues to buy a gallon of maple syrup, it might eventually require $40 US dollars. That’s constant purchasing power, and value remains high. All this is going to require a lot of conversations in the community about money and how to responsibly issue it. We’ve already been approached by people asking for BerkShares to be printed for our local non-proﬁts. No, the only way BerkShares should go into issue is for productive loans. I was also asked about a household that needed a new oven. No, that’s a consumer loan. An oven for the baker that could result in 50,000 loaves of bread feeding the community is one thing, but an oven for the individual household is to be purchased through savings. In the past, there were commercial banks and savings banks. Savings banks made the home mortgages, car loans and vacation loans—all consumer lending that is appropriately with interest because you’re borrowing someone else’s money. But productive loans involve the creation of new money, and interest should not be a part of that. Complex, yes, but in the past, citizens knew these things. Savings banks and commercial banks did two separate things. Now banking, insurance and all ﬁnancial instruments are inappropriately put together in one institution. Messy. Confusing. We don’t know what money is anymore. Rudolf Steiner advocated having money dated. When created, money would have a date on it and would disappear in value over time, just the way the products it creates disappear over time. Silvio Gesell was a famous Austrian who came up with the concept of buying stamps to keep dated money current. This encouraged generosity. If people were holding on to money that was getting old, they’d give it away. When there was something left over after they had purchased all of their goodies, they would give it away. Where? To the churches and synagogues, to the non-profits and science, to organizations that have people—let’s say the minister—who need payment now to go out and buy food for the week. Money would circulate and encourage that gift economy without federal taxes, just through the instrument of the money itself. I see. And I notice that you just used an example of buying the weekly groceries. Food production and consumption must be strong drivers of an economy. 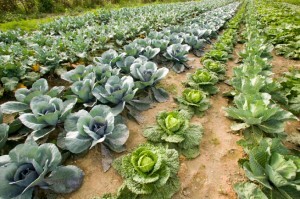 What about regions that are not self-sufficient in producing their own food? With the movement towards urbanization—with 50% of the population living in cities today—that means transporting food into cities. And what about food sustainability, especially in the winter? It’s an issue that readily comes to mind because we have long cold winters here in the Berkshires. There are people like Elliot Coleman in Maine who have come up with multiple ways of extending the growing season with small greenhouses and intensive planting. The ideal is more neighborhood-level than industrial-level food production. We’ve got to look at how we can extend our season of local food by means of canning, freezing and other methods. We have to start thinking creatively around this. A lot of things have to be put in place for sustainable local food production. First, you’ve got to have aﬀordable access to land. Our community land trust is addressing that issue with housing and farming at the Indian Line Farm down the road, and the same method could be used for commercial spaces. Let’s say that you want a cannery. What’s holding it back? An aﬀordable site is part of it, but a group of community members working through a non-proﬁt like a community land trust could get together and purchase the land and then lease the site, with no cost for the land, as long as that community purpose is being met. This means that if a new group took on the cannery, the land couldn’t be resold. Only the building, the infrastructure, would be resold. So it would remain always aﬀordable, with a one-time purchase of the land and its value. Aﬀordable access to credit that’s appropriate is also needed. Keeping with the cannery example, suppose a new group comes in that has never done canning before. Should the bank take the risk or not? BerkShares was created in part to be able to make no-interest loans in a local currency, with the community taking the risk. Appropriate credit that knows the local circumstances and involves the local people is important. Finally, markets are important. Community Supported Agriculture (CSA)—the very ﬁrst one was started on Indian Line Farm—is a way that consumers can get together and guarantee the farmer’s yearly operating costs. They each purchase a percentage of the farmer’s shares and thus form a guaranteed market. There was a terrible tomato blight last year, and shareholders got no tomatoes. Did they fuss and fume and ask for a refund? No. It’s part of the deal. They shared the risk with the farmers. If there were no tomatoes, then they got no tomatoes. You need that guaranteed market. A CSA organizes individual consumers. Adding institutional buyers would be even better. It would be incredibly powerful if we could organize the schools, insurance companies and nursing homes, for example, to contract locally with farmers. All of us as concerned consumers need to look at every single one of our purchases and source them locally. It’s not enough to buy things from a locally owned shop—although that’s a ﬁrst step in the right direction. We need to think about whether the goods in that shop are produced locally. We need to ask what we import to our region that could be produced locally. And we have to make it feasible to create that local economy. A major debate in global economic circles is about how to have growth in the economy with limited resources. We want jobs for people, but that usually equates with more stuﬀ. If you change to a system where you manufacture locally, it’s going to be in smaller batches. Smaller batches means more labor intensive. More labor intensive without more stuﬀ. More labor intensive means more jobs. More jobs without more consumption, bringing production back locally and not having to ship goods over long distances. It’s about changing the consumption patterns. Right. We need to learn to stop buying mass-produced goods just because they are cheaper and to recognize the hidden costs, including labor being dispensable. Or treated poorly. There are also unaccounted-for costs of transportation subsidies. For example, our war in Iraq is a subsidy because of our dependence on oil. If all the real costs were factored in, you’d see that the global products are not cheaper. If you look at the cost in terms of harm to the environment, the cost in terms of human degradation, the cost from the conﬂicts that arise to keep up lifestyles, then those large quantities are not cheaper. So we have to move toward making a fundamental shift of priorities and habits. Thank you so, Susan, for all you do for our community. As a member of BerkShares, Kosmos is most appreciative. We wish you the very best in your new role at the New Economics Institute. Any last words for our readers? What is economics at its core but a system for organizing human labor to transform the earth into products for one another? The outcome of that transformation can either degrade or enhance all involved. I believe it is our responsibility—our spiritual task, if you will—to create an economic system that embodies our highest ideas as human beings, one that builds community, advances ecological health, creates beauty, provides sustainability and encourages mutuality. Ultimately, a joyful task. Susan Witt was Executive Director of the E.F. Schumacher Society that is now transitioning to the New Economics Institute. She is Administrator of the Community Land Trust in the Southern Berkshires and co-founder of BerkShares local currency. www.neweconomicsinstitute.org. The full text of this article can be found in the Fall | Winter 2010 issue of Kosmos Journal or can be downloaded as a PDF here.